As resistance training is undertaken for an extended period of time, an adaptation occurs where the number of Type IIa muscle fibres increase while the number of Type IIx decrease compared to pre training. This has been shown in Andersen & Aagaard  and Andersen et al.,  where a significant increase in Type IIa and a significant decrease in Type IIX were found post 3 months of training compared to baseline. Once these measures were taken in the above two studies, a 3 month detraining period was implemented. Detraining meaning no resistance training was performed and the subjects returned to their normal daily lives (subjects in both studies were sedentary, no previous regular resistance training and no regular exercise within the last year). So what happens after a detraining period? The proportion of Type IIX muscle fibres increased past baseline PRE training values while the proportion of Type IIA muscle fibres significantly decreased below PRE training values. This is known as the “overshoot.” (Type IIX surpassing pre training values). Significant increases shown in total Type II muscle fibre. More importantly, significant increases in Type IIx fibres post detraining. What about performance post detraining period? 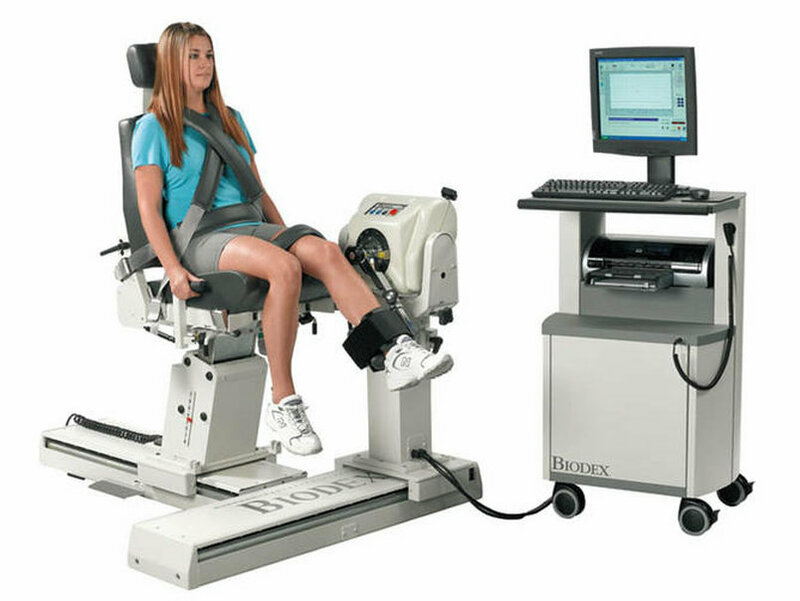 Andersen et al.,  used isokinetic, maximal unloaded knee extension and evoked muscle twitch to measure performance. Isokinetic muscle strength and power at 30˚ and 240˚ decreased back to pre training levels. 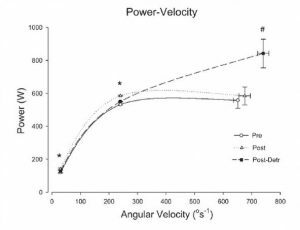 However, angular velocity, angular acceleration, total moment of force, and power during the maximal unloaded knee extension all significantly increased past PRE and POST training values. 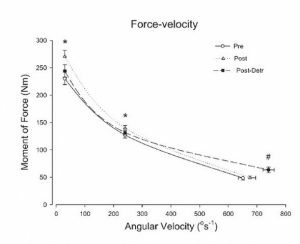 Furthermore, peak twitch rate of force development (RFD) significantly increased post detraining compared to pre and post training. An interesting point to note is that the subjects produced greater force post detraining at greater velocities compared to both pre and post training. Also, subjects produced more power compared to pre and post training at greater angular velocities (graphs above). From these data, we could speculate that the overshoot may only relate to high velocity unloaded movements (E.g. punching, sprint cycling, sprinting). However, I have also heard this method being used in great success with the starting push for bobsled, so even some loaded velocity movements may benefit. The subjects in these two studies were sedentary individuals. However, could the same be done in professional athletes where taking 3 months off resistance training is just not an option? Stay tuned for part 3 where we delve into the “overshoot phenomenon” in professional sport. Andersen, L., Andersen, J., Magnusson, S., Suetta, C., Madsen, J., Christensen, L., Aagaard, P., Changes in the human muscle force-velocty relationship in response to resistance training and subsequent detraining. Journal of Applied Physiology, 2005. 99: p. 87-94. 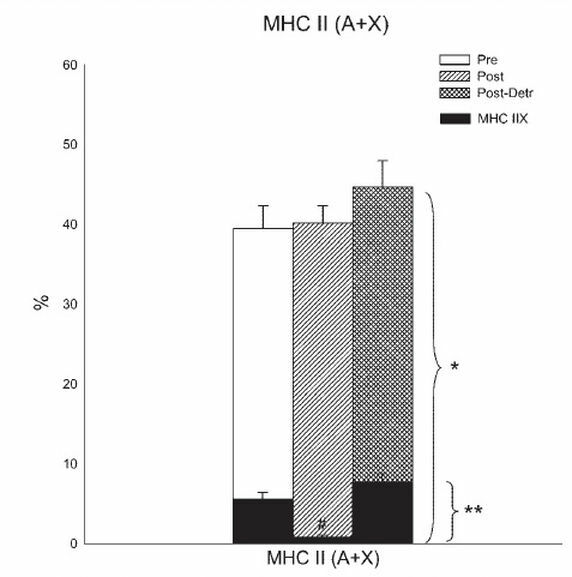 Andersen, J., Aagaard, P., Myosin heavy chain IIX overshoot in human skeletal muscle. Muscle Nerve, 2000. 23: p. 1095-1104.